Technically no. it is a microwave spectrum analyzer that will alert to police radar and/or laser when programmed to do so. Because of this no radar detector detector, including the Spectre, can detect it. Do you own a high performance car? Do you want a system that isn’t going to pester you with false alerts? Do you demand the very best in speeding ticket protection? If you answered yes to all these three questions, then the Stinger radar and laser system is worth every dime you will be investing. 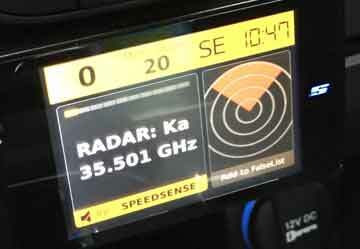 Police began using the Spectre RDD back in 2005 in the Netherlands and Australia to detect radar detectors in cars, as they were illegal there. Because of this I began getting lots of inquiries from companies interested in developing a Spectre proof detector. So through my connections in the law enforcement community I was able to purchase one from Stealth Micro Systems. A few weeks after I received my Spectre, the Stinger family in the Netherlands contacted me through the Flitservice.nl radar detector forum, requesting that I test their unit against my Spectre. A few weeks later, two associates came to our office with their Stinger. The Stinger is not a radar detector, but a microwave spectrum analyzer that receives, analyzes, filters and then displays a threat analysis on a mini LCD screen based upon threat level and strength. The antenna for the unit is also flat, like a square pancake, developed using military grade technology used by NATO to receive and decode weak microwave radio signals. We installed it in my F-250 to test it and I was impressed! Not only was it the first radar detector I found that was able to defeat the Spectre, its range was superior to all the other remote mounted detectors that were available during that time. Radar detector laws in Australia and Europe are very harsh. As an example in Queensland you’re fined $3,000 and get 40 points on your license. And the speeding ticket fines are much harsher too, with an automatic 6-month suspension on your driver’s license and a $1000 fine. Because of this the Stinger became one of the best selling radar detectors in Australia and in many countries in Europe. Stinger made the official announcement that they opened shop here in the USA on December 25th, 2014 and scheduled a time where they will be coming back to our office to do an official review and test of their system in mid January. In preparation for this full review, here are some of the things I’ve learned about their new system that I can share. The answer is no, because it’s not a radar detector, it is a microwave spectrum analyzer that can identify police radar threats when programmed to do so. Because of this the Stinger does not use RF modulators or cone shaped antennas used by radar detectors. This enables the Stinger HD antenna to be a closed system that is fully stealth to all RDD’s, as it does not leak any radio frequency. The Stinger VIP system comes equipped with two flat antennas, one front facing you mount behind the grill, and the other rear facing that you can mount on the rear deck of your car. The biggest advantage of the Stinger system is its extreme range and ability to detect the low powered digital K and Ka band radar guns used by today’s police agencies. And unlike radar detectors that have only horizontal polarity, the Stinger HD Antenna has both vertical and horizontal polarity. This enables the Stinger to sniff out low powered vertically polarized K and Ka band mobile photo radar vans. And because the Stinger is a spectrum analyzer instead of a radar detector, it has 0.0001 Gigahertz accuracy. This enables the Stinger to filter out false alerts, while focusing its attention to sniffing out real police radar threats. The Stinger Computer Center box is the brains of this system, measuring 5.551” x 2.543” x 1.102” and typically mounted under the dash of the car. 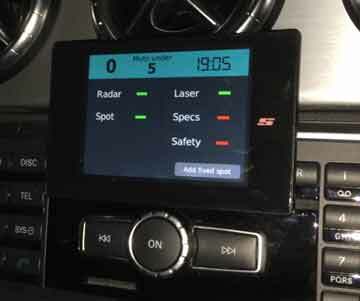 Here is where the radar detector antennas, the LCD display, power cables and optional laser jammer heads all connect. The Stinger Spectrum Analyzer is also another unique feature only found in their system. The standard display measures 3.27” x 2.09” x 0.28” and is mounted to the Stinger LCD display holder. Green Display: When not in scan mode the LCD is green displaying the direction you’re traveling, your speed, the time and the operating mode(s). Yellow Display: Once the Stinger senses a threat it alerts yellow identifying the exact frequency, band, signal strength and the direction of the threat. Red Display: Here the Stinger system is in full alert mode, identifying the threat level as high, identifying the threat level by signal strength, direction, exact frequency and your speed. The VIP LCD display holder can be mounted to your dash, center console or other area within the cabin of your car. This then enables you to easily attach your LCD VIP display screen. The external GPS antenna can be mounted on the dash, or on the outside of the car such as the hood. Each Stinger system includes an external speaker that is typically mounted under the dash of the car. Your Stinger police radar and laser defense system comes with easy step-by-step instructions for self-install, or for 12 volt installers not familiar with the system. Your Stinger system also includes a VIP operating manual in English, that will walk you through the process step-by-step in programming your system and how to use your syestm. Updating your Stinger radar and laser defense system is a snap using Stingers Mac/PC desktop software. Just start up your Stinger desktop software, insert the Stinger USB drive and download Stinger’s latest software updates. 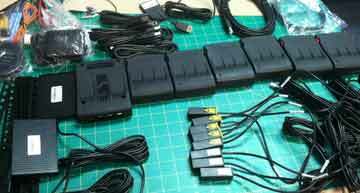 Then plug in your USB to the Stinger Controller Box. Another unique feature found with the Stinger system is the ability to log mileage reports and your driving history. By simply downloading your Stinger data from your controller, to the Stinger USB you can use the Stinger desktop software to manage trip data, print out reports and even use the PoliceCheck files as supporting evidence in court. The Stinger Laser HD transceivers have the smallest footprint in the industry, about the size of a dime and can be easily concealed within the grill area or bumper area of your car. When ordering the Stinger HD for the front you will receive two pairs of sensors, two receive and two transmit, which you would mount in the area of each headlight. You can also order an additional third set for placement near the front license plate. The Stinger HD Laser Jammer sensors capture and analyzes laser with extreme precision, with less hardware and jams all known laser jammer guns used in the US including the Dragon Eye and other variable pulse rate and random pulse rate laser guns. A laser analyzer box is included with each pair of the optional laser-jamming transmitter ordered. 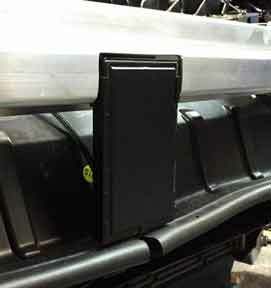 The Laser Analyzer box measures 3.228” x 4.331” 1.118” and is typically mounted under the hood for front jamming heads or in the truck for rear jammer heads. Stinger also offers their unique optional laser fiber heads, which enables you to mount side-mounted laser jamming transmitters to jam the ENRADD side laser speed measurement devices now being installed in Pennsylvania. 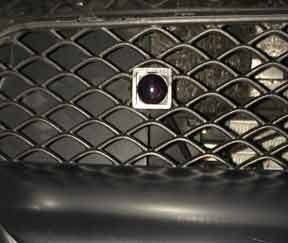 The laser fiber head only measures 0.118” in circumference and is 0.551” long, making it very easy to conceal behind a rear license plate for side ENRADD laser jamming. If you’re interested in outfitting your car with the Stinger system, I recommend that you wait for a few more weeks as I’ll be doing my full test and review on Stinger’s new HD police radar and laser defense system in mid-January and I will be posting the results on this page, so please stay tuned for more!